I pretty much know every taco truck that parks on the Westside so when saw a taco trailer parked near Olympic Blvd and Barrington I got very interested. 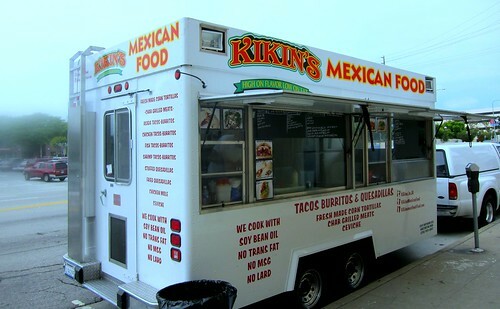 Kikin’s is kind of a cross between the traditional lonchero and the gourmet food truck. The menu: tacos, burritos, quesadillas, and ceviche are standard truck fare, but the preparation that emphasizes healthy eating with soybean oil and leaner meats you would never see on a lonchero. The price, 3 tacos for $5 is gourmet-ish. So is the whole twittering thing (Kikin's doesn't have a set location like your standard lonchero). So who will Kikin’s appeal to? The taco truck crowd or the relatively new I’m-not-afraid-to-eat-from-a-truck-anymore-because-everyone-is–doing-it- crowd? Probably both. These are damn good tacos. 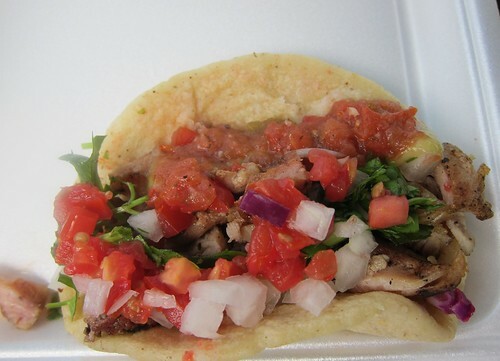 First off, three of these tacos for $5 is a bargain. They’re big tacos with quality meats and fresh tortillas. 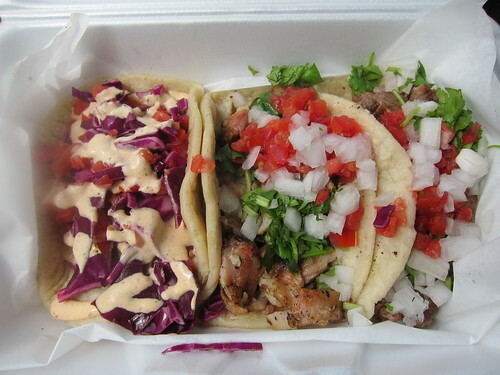 These aren’t just good tacos, they are easily the best tacos I’ve had west of the 405. While the meats for my tacos were grilling I watched as masa was pounded, formed into shape, and toasted on the grill. Yeah, lots of places make homemade tortillas, but I don’t think I’ve had a fresher tasting tortilla anywhere. I ordered shrimp, carne asada, and pollo. The pollo had a good char to it with little crispy skin bits and tender bits of chicken. 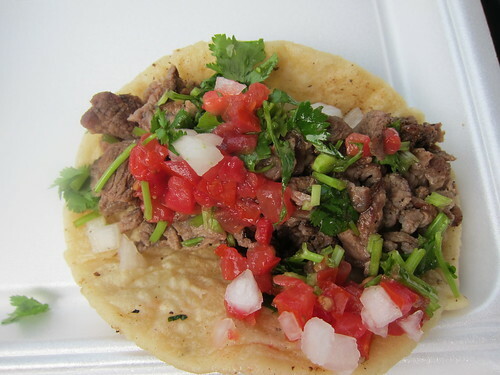 The carne asada was top quality and lightly seasoned to bring out the flavors of the beef. Both tacos were topped with fresh tomato and onion. The shrimp taco was a little more adventurous with a chipotle mayo dressing covered a bed of red cabbage and tomato. Under all that was some pretty tasty shrimp but after just one visit I’m pretty hooked on the pollo and carne asada. If there's one thing I could have used was something spicy on my plate. The salsas provided(salsa roja and avocado salsa) were good but neither was very spicy. A grilled jalapeno placed on top of my tacos would have really sealed the deal.